I met this new company at the Enterprise 2.0 show last week and was immediately intrigued by what they do - which is solving the interoperability problem for the video conference market. 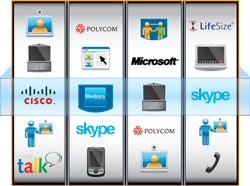 The problem is real - everyone has something different in terms of video conference technology and unless you do all the video conference inside of the enterprise and none with clients or partners (although even that stands to be challenged), they are facing a problem of having spent a pretty penny only to learn that you can not use it 90% of the time because of interoperability issues. Pricing ranges between $69 and $199 per month, with $199 being "all-you-can-eat" plan, and if you're any serious about videoconference that's probably the one you'll use. Considering that they do both protocol translation and in most cases transcoding on the fly, the pricing is very reasonable.. But what about Michael Scott? ?